To reach the School of Vision — a cutting edge combination business: UFO cult / Rasta sect / Bed and Breakfast — one must spend a half hour rumbling up the narrow, winding roads that circle the Blue Mountains outside Kingston, and then forty minutes trudging up makeshift stairs through a hillside jungle. Consequently, the inhabitants of the School regard every visitor as a compliment, and sometimes a bit more. “No disturbing,” he said, but I was very disturbed—until, that is, I walked out of the shadows of the forest into the light of the village and forgot my reservations. I expected a tent circle, because that’s what I would have done, but scattered up the mountain, the School of Vision had built themselves a comprehensive civilization of iron, wood, red, green and gold paint, with a tabernacle, a landing, a dozen beautiful huts. Its name, Mount Zion, seemed about right. The village faces the entirety of Kingston, with a view that extends past the airport to the sea. The grounds are tilted downward slightly, leaving the inhabitants with a view that resembles looking out of a slanted skyscraper. Turning away from the city, on the concrete landing that lines the way to the mountain edge, we gazed up at their creation. “We made the mountains bloom!” Jeremiah exclaimed. And indeed, the Rastas’ professed attunement to nature had registered in delicate aesthetic decisions. Bloom seemed like the right word. In their construction of the village, the school had arranged themselves with the land, building their huts sparsely, in the few spaces where the land was relatively flat, fitting each to its particular slope so that everyone leaned ever-so-slightly with the angle of their plot; the Rasta colors, painted on each household that could afford it, also seemed exactly right, blending with the greens and reds of the forest and the gold of the sun. The school’s tabernacle, with its quadragon roof made of corrugated iron, and its weathered plank walls, looked a bit drab when we entered the village, but then the sun asserted itself at full stealth, as it does, and the roof shone back, suddenly looking chosen, fitting, like everything else. To my initial alarm, one panel by the main entrance had a star of david tagged on it with a cross through its center—then I realized that this was an appropriate representation of a faith that considered themselves both Jews and Christians. 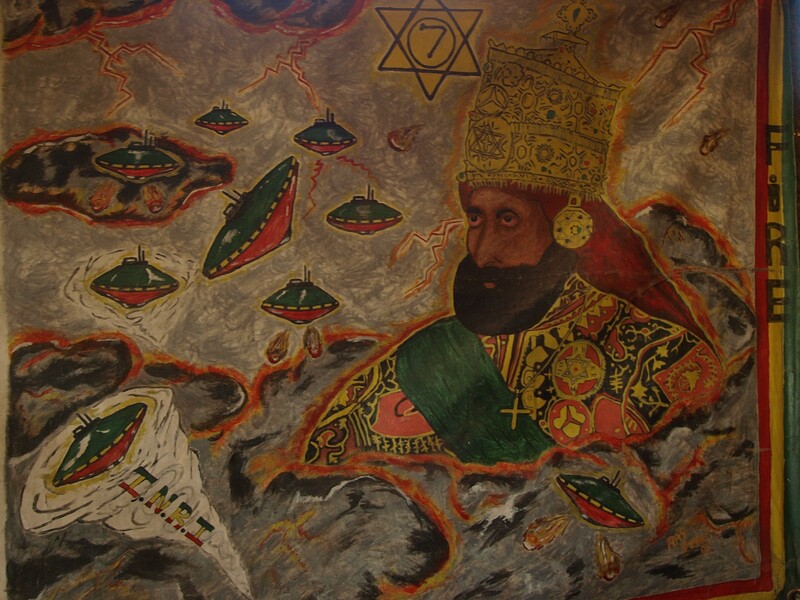 More prominently, UFOs were emblazoned everywhere, sometimes overseen by a very stoned-looking Haile Selassie. Jeremiah took us to meet the School’s founder, Pastor Dermot Fagan, whose house sits at the center of the village, overlooking the landing strip. A fit middle-aged man with sly eyes, and a band-aid on his forehead he didn’t care to explain, Fagan was sitting at a large table with his hand in a bowl of ganja, of which he gave us a handful. This will open your mind, he said, and it did — too much perhaps. Going forward, all of my memories of the mountain are scrambled, my notes unstructured, the days we lived in one of their guestrooms (how many?) hazily overlapping. At some point that afternoon, Fagan informed us that the landing strip was for UFOs commanded by Haile Selassie I, whose third coming was going to chime in the end times for everyone but the men and women baptized on Mount Zion, who He would fly back to the promised land to rule over the depopulated earth. Other villagers gathered around us and casually substantiated this rather major claim, and I remember thinking that there was a vast gulf between content and presentation. Just as otherwise normal people believe that the earth is flat, the cultists of the school of vision are friendly everyday folks who talk about divine UFOs like they’re the most normal thing in the world. Fagan, the originator of the story, was the only one who articulated it with prophetic fire. 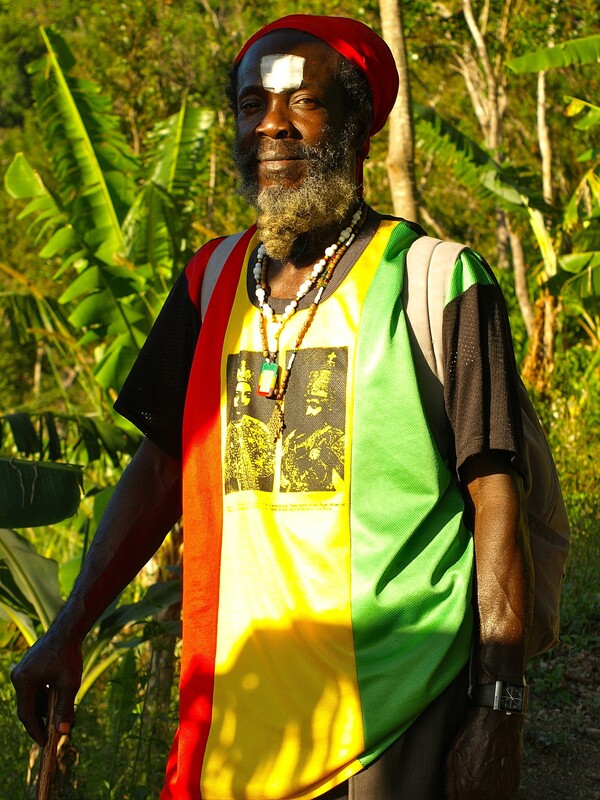 Like many infamous Rasta leaders before him, starting with Rastafari’s founder Leonard Howell, Fagan found his way to Rastafari by way of an American institution. In 1997, after serving several years upstate for narcotics distribution, he arrived back to his native Jamaica with the intention of building a church. It was then, he says, that Selassie started appearing to him, preparing him for His Third Coming and the subsequent apocalypse. Fagan started street-preaching, eventually acquiring a banner and a small following. In response to one of his visions, they relocated to the blue mountains, building this beautiful civilization. Like every new leader of the perpetually schisming faith, Fagan added something novel to the doctrine — a science-fiction bent, in this case. Like all great cult leaders, Fagan pairs the miraculous with the utilitarian. Speaking to his assembled flock in the tabernacle, he made the argument for life on the mountain. “Down there…you can work three jobs and hardly survive. Up here——I&I can live!” This was hard to disagree with, but the ideal of self-sufficiency has not yet quite been achieved. Every weekday, at the crack of dawn, most of the School’s men venture down the mountain to labor in the city, returning up the mountain at nightfall, often carrying up bulky supplies, doors, tables, chairs, arriving tired and relieved. The children accompany them; though Armageddon is looming, the parents in the school take their children’s worldly education very seriously. Priest Fagan himself spends half the week in town, doing religious outreach. Aside from a security guard or two, and the few full-time farmhands working the fields, on most afternoons Mount Zion is the providence of the school’s housewives. “Keeping it all going up here is a lot of work,” a woman (whose name I noted illegibly) told me, as she took a break for homemade ice cream and looked down at the city. She told me she didn’t miss life in Kingston at all — tried not to think about it at all if she could. “It’s safe, it’s calm, you get respect, she concluded with a shrug.” Anyone with a pedestrian’s knowledge of Kingston, particularly a female pedestrian’s knowledge, will understand the height of these perks. On our last morning, we woke up to the sound of shouting. The worst kind of shouting to wake up to: in chorus. “Burn them!” I scrambled out of bed and stared through the cracks in the wall. “Burn them!” The gleeful voices of children rose over the rest. “Burn them!” It was coming from the tabernacle. The whole village was screaming. We hid under the covers; had we done something wrong? Once the voices died down, I looked back out and saw the usual pedestrian smatterings. “You missed our ceremony,” a chipper Priest Fagan said to me. Kids streamed out, going to school with a bop in their step. This, it occurred to me, was a bit like a pep rally. 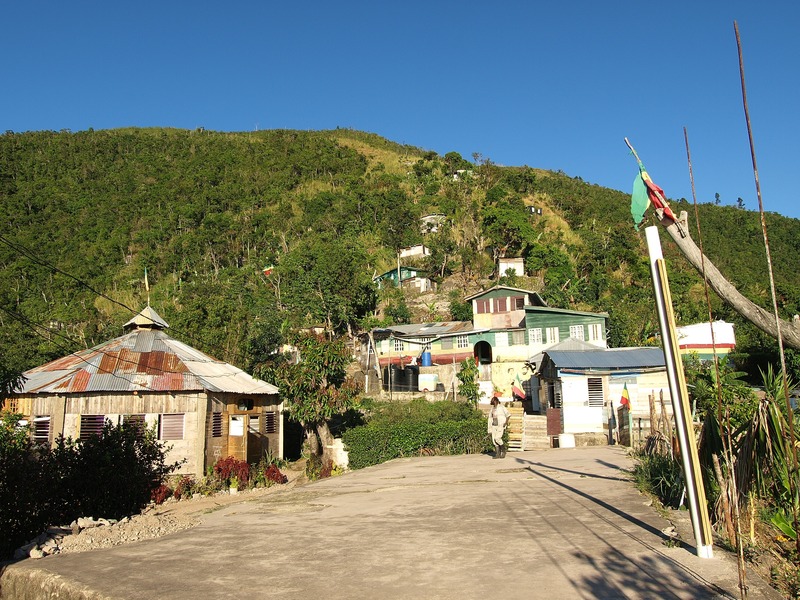 I knew of Rasta’s militant aspects from listening to Reggae, but assumed somehow that this community, with its enterprising US-educated priest, its Bed and Breakfast, eschewed that rhetoric. I went back in to have a heart attack and pack my things. Winding our way down the stairs that evening, through the brush on the muddy stairs, we encountered the entire village one more time, stopping for a short farewell talk before we snuck past each other. First: Priest Fagan, Rasta colors from turban to toe, still alternating between sly measuredness and glorious pronouncements. “If you overstand, I am sure we will see you again, and you will tell all good people of us. The time is now! And tell the good people of Germany that I&I will require the best pipes and waterpumps when Him return.” He turned to his assistant: “Them Germans make very good machines, you know.” Then a group of school girls skipping up the mountain I could hardly stagger up. “Did you have a good time?” the oldest one, a confident 12, asked me. I raved. “That’s what all visitors say,” she said, smiling. I asked her if she liked school. She nodded emphatically, with a huge smile. I asked her what her favorite subject was. “Religion,” she said. “Which is the best?” She laughed, and pointed to the tip of the mountain. And I could see how fascinating it was to her to return every day to this exalted place with its big stories. If you think the beliefs of the school of vision are absurd, I assure you they think that yours are too. That said, Priest Fagan’s does seem to gamble the credibility of his School with his bold prophecies. At some point down the line, with the UFOs still not arriving, this may hurt his credibility. 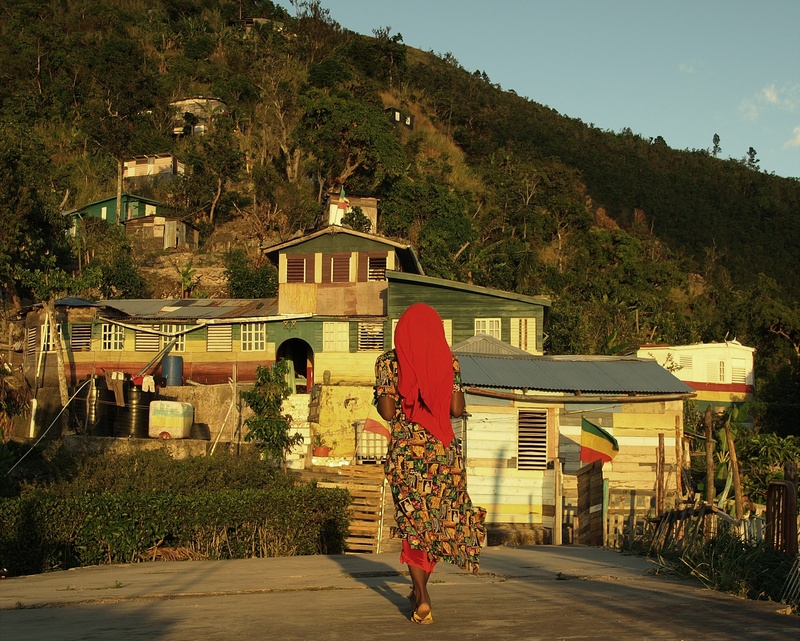 Already now, the inhabitants of his village don’t seem particularly transfixed by the immediate prospect of Armageddon or divine repatriation; moreover, they seem to quite like their spot in Jamaica. That’s one of the inherent ironies of the School of Vision and Rastafari, more broadly: though an attempt to honor Africa, it has, through its activity, turned Jamaica into a holy land. All photos courtesy and copyright of Ariane Wolf.